Do you often collect images from the web? Of course you do, as all of us. As a creative and graphic designer I’m always looking around for inspiration and one of the best way for me is to collect images that stimulate my creativity. Of course if you just collect images without organizing them this method suddenly become just chaotic, losing its utility. So, the problem is how to organize this material? That’s why we decide to improve Licorize creating an easy way to get images from the web. Licorize 2.0 makes collecting photos easier than never. 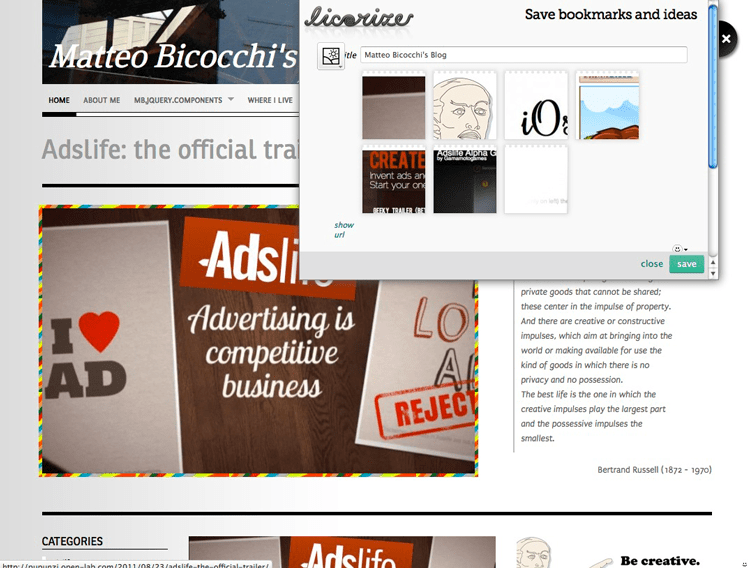 You can now open the webpage where you found interesting images, open the Licorize bookmarker window (available as plugin for Firefox, Chrome and Safari or as bookmarklet for all the others), click on any image you want to add to your collection and that’s all! Images will be automatically added to your strip; the strip can be associated to a public or private project, you can add as many TAGS as you need; you can make a public or a private booklet viewable by everyone from everywhere…. As for images you can collect videos; in that case, if you are on a Vimeo or Youtube page and you use Licorize, it automatically detects the video and suggests you a Video strip type with the actual URL embedded. If the video is embedded on a generic page you can get it by clicking on it once the Licorize window is active; the strip switches automatically to the Video type and the game is done. If you already use Licorize than you just have to try this new feature (and all the other explained here: http://blog.licorize.com/2011/09/07/licorize-2-0-bookmark-presentations-rssflipboard-integration-maps-location-handling-and-more). I ADORE licorize and I’m sure that everyone which has intelligent, has good taste, imagination,and needs en app. which really can enclude all these quality, or he/her has it already or her/him will buy it just immediately! it is a MUST for the apple clan and also all other clans!! !